Right in the heart of touristy street walking on Commercial sits an unassuming Japanese restaurant. Though I’d seen it busy on many occasions and walked by it probably 1000 times, I never had it in my mind to actually go in and eat there. But with my kitchen in pre-renovation shambles and a hungry wife craving some sushi, we thought a trip to Saporro might be just what we needed. She had been, so it wasn’t totally new to her, but would still have a little essence of newness since her last visit was years ago. We headed there on a Monday, which isn’t a day we usually go out, ready to eat some fine Japanese tidbits. We walked into the restaurant and I marveled at the tiny space. A waitress greeted us and quickly took us to another room which was at least the same size as the one we walked into, removing the quaint atmosphere feeling I had when entering. We sat down and took a look at the menu. I was reminded by it how odd of a human I am when it comes to sushi. I wished I didn’t have such a distaste for raw fish and avocado and an aversion to chopsticks, but unfortunately, I was born that way. Luckily, as is always the case, Sapporo seemed to have at least some items of cooked and vegetable sushi. I moved through the menu looking for something that stood out. I had a bit of teriyaki chicken running through my head, but I decided I wanted something a little more exciting. 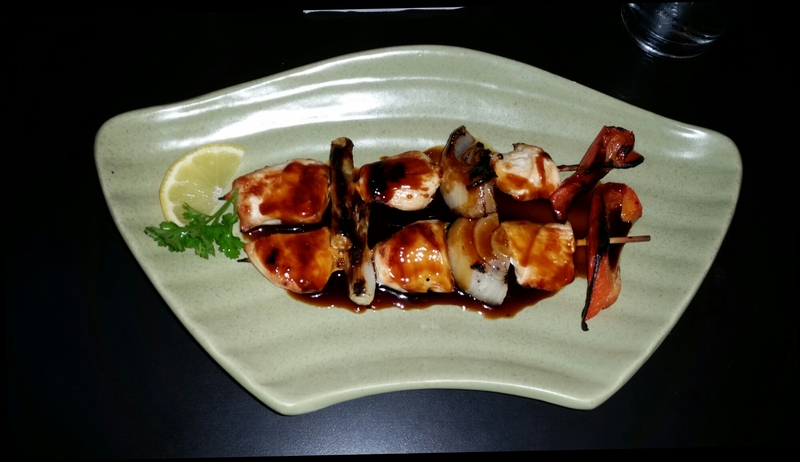 Then I saw the Yaki-Tori – grilled chicken and vegetable skewers. I thought that might be an novel way to begin my meal. My wife said she was going to start with some Miso Soup and Seaweed Salad – a variety of shredded and marinated seaweed. It was off to the races to figure our our main courses and we were both looking at some sushi, even though she also considered, as I did, the teriyaki clucker. When the waitress came to take our orders, I asked for silverware and then we put in our apps and went with some rolls. 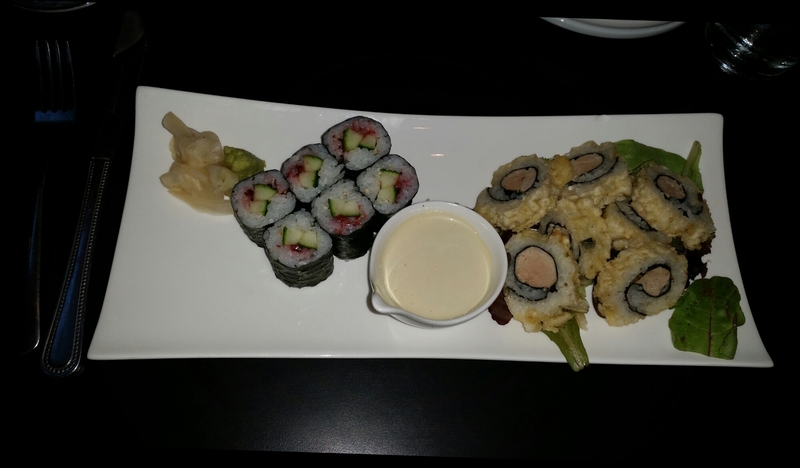 I had the Umukyu – Plum paste and Cucumber Rolls and also the Fried Tuna Roll – deep fried tuna with wasabi mayo. 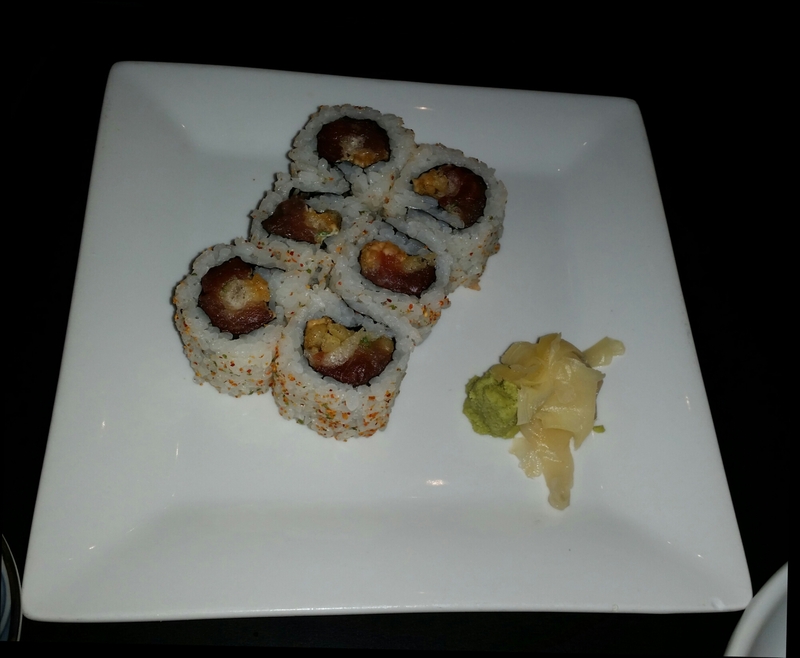 My wife went with the spicy tuna roll, which is a favorite of hers, and also ordered a riesling. The waitress left to bring the orders to the sushi chefs and I noticed that the restaurant was starting to get pretty busy. It was a little surprising for a Monday night, but I supposed people needed to eat on Mondays too. The wine came quickly, but otherwise service was slow and it was confirmed by our waitress that the rush had them scrambling. I finally received my chicken skewers, though my wife remained seated with only vino and her thoughts. Chicken, scallion, chicken, onion, chicken, red pepper. Nicely grilled and sizable, the chicken and veggies were topped with teriyaki sauce and a significant amount of the sweet, brown liquid also sat at the bottom of the plate. I grabbed some chicken and then scallion, dipping and dragging them through the puddle before consuming them. The starter reminded me of something I might have made in college if I had had a grill. The skewered bits with teriyaki topping were simple, but pretty tasty. After a few minutes of skewer madness, I had only two empty sticks and some sauce left. It was a while before we got the rest of our food, but when we finally did, it all came out at once. I poured some soy sauce into my little bowl and got to eating. I started with my umekyu. Wasabi on fork, fork into roll, roll into soy, roll into mouth, eat, consume pickled ginger. My sushi ritual was complete for piece number one. I was a little surprised by the sour plum paste, thinking I might have preferred just plain cucumber rolls, but there was something about the roll that I did enjoy. Maybe it was the change of pace from my usual cucumber rolls that provided a bit of a smile to my face. As I worked on the sushi, I came upon two issues of minor concern. The first was that there was just barely enough pickled ginger to go with my plum and cuke rolls. Next time I’ll be sure to ask for more as I would have liked some for my tuna too. The other issue was that the wasabi was cut too weakly; it just wasn’t quite hot enough for me. I wanted a bit of that “scorch your nostrils and eradicate your tastebuds” sort of feeling I’m used to with the hot, green Japanese paste. I wanted to cough with tears running down my face while people around me gave that knowing look and I tried to catch my breath. I used a little extra on my rolls and it sufficed, but it wasn’t ideal. Once I worked my way through the first rolls, I took the midnight train to tuna town. The fried rice and tuna roll was bland on its own, but I dipped a piece in the wasabi mayo that came with it. It added a creamy seasoning that took the sushi to some great places. Not very spicy, but still a nice addition, the mayo added a layer of flavor that worked well with the seafood. The outside crunch from frying provided a little extra touch. I crunched and munched the rolls, adding a dose of wasabi to every bite in order to get some heat through the cool sauce. My wife made her way through the soup and some of the salad, moving on to the sushi which she seemed to enjoy. Once I finished my rolls, I ate the rest of her seaweed and it was about what I figured it would be. I enjoy a good seaweed salad here and there and it fit the bill. She offered me some of the raw tuna, but I shook my head and gave a “No!”. She finished the sushi and we passed on dessert when asked. I was still a bit hungry, but figured I’d grab a snack at home. Our meal came to $40 before tip which was quite reasonable, especially since it included an $8 glass of wine. I liked my food, though I would have appreciated a more spicy, harsh wasabi and the service could have been a bit speedier. The rolls were good and my starter was basic, though worth the four bucks it cost. 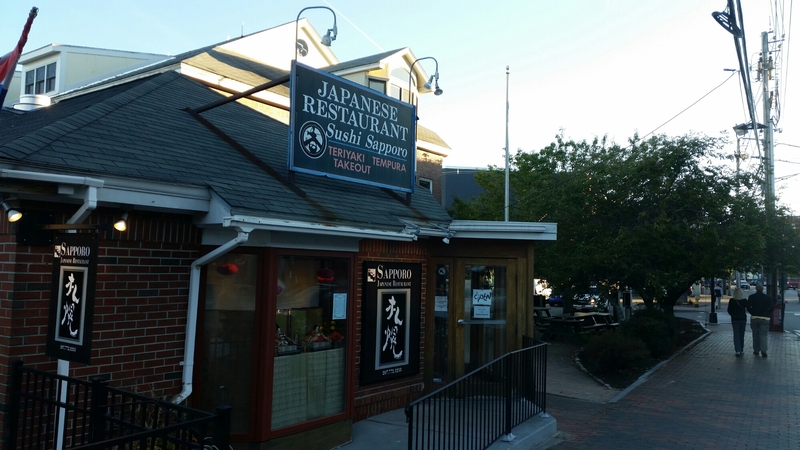 Sapporo has been around for a while and there seem to be a steady stream of patrons rolling in. I think they could improve a few minor items, but I wouldn’t hesitate to go back. I felt they had a solid menu, good food, and a pleasant atmosphere. Go grab some rolls or a teriyaki of some kind and report back. Feel free to email me at peterpeterportlandeater@yahoo.com with any thoughts, suggestions, criticisms, or otherwise helpful info or post your thoughts below. Also, like the Peterpeterportlandeater page on Facebook and follow @portlandeater on Twitter. You can now also see me at pppe.bangordailynews.com. This entry was posted in Portland, ME food on September 20, 2016 by peterpeterportlandeater.